Panasonic today announced two new high-definition camcorders, each equipped with three low-light-optimized Live MOS sensors and the ability to record 1080p video at 60 frames per second. The hard-drive-based HDC-HS700 (240GB) and flash-storage-based HDC-TM700 (32GB) also snap 14-megapixel stills and offer additional storage via slots that handle SD, SDHC, and SDXC cards. Panasonic is touting the low-light performance of both HD camcorders, claiming that the 3MOS system captures bright, crisp video with good color accuracy in darkly lit settings. Both camcorders support operation via a flip-out 3-inch LCD touchscreen, and both have an eye-level electronic viewfinder as well. Each of the two high-end consumer camcorders also offers manual controls for focus, aperture, shutter speed, and zoom by way of a dial around the 35mm/f1.5 wide-angle Leica lens. More beginner-oriented features include optical image stabilization (which Panasonic says has improved dramatically over last year's version), Intelligent Auto shooting mode, and a setting that automatically snaps a still image during video recording when an on-camera subject smiles. Atop the camcorders are 5.1-channel surround-sound microphones, equipped with two notable audio tricks: Each microphone can "zoom" to capture audio independently, and a "Wind Noise Canceller" feature analyzes the audio track and strips out noise caused by breezy conditions. 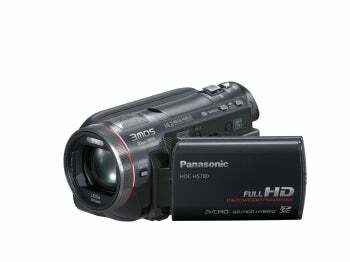 At the highest video resolution and frame rate (1920 by 1080 at 60 fps), both camcorders record MPEG-4 video using the H.264 codec at a 28-megabits-per-second bit rate. That's higher than the bit rate the AVCHD format supports (24 mbps), which means that the file sizes should be a bit bigger, but the raw footage is compatible with most video editing and playback software. 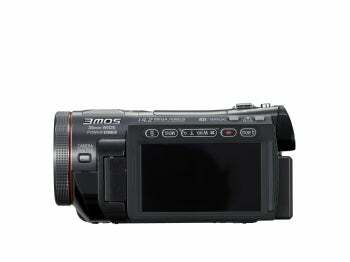 Both camcorders also shoot 1980-by-1080-resolution AVCHD video at lower bit rates: 17 mbps, 13 mbps, 9 mbps, and 5 mbps. Panasonic has not announced pricing or availability information for the HDC-HS700 or the HDC-TM700, but judging from the pricing on last year's high-end Panasonic HDC-HS100, the cost for each will probably be somewhere in the $1300 range.